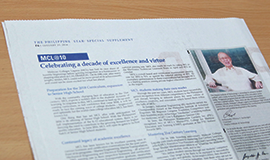 A special supplement on Mapúa Institute of Technology’s 91st Foundation Week and Malayan Colleges Laguna and Malayan High School of Science’s 10th Foundation Week celebrations released on The Philippine Star on January 25, 2016. 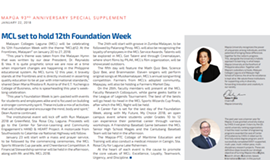 A special supplement on Mapúa Institute of Technology’s 92nd Foundation Week and Malayan Colleges Laguna and Malayan High School of Science’s 11th Foundation Week celebrations released at The Philippine Star on January 23, 2017. 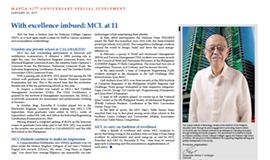 A special supplement on Mapúa Institute of Technology’s 93rd Foundation Week and Malayan Colleges Laguna and Malayan High School of Science’s 12th Foundation Week celebrations released at The Philippine Star on January 22, 2018. The joint press statement by the House of Investments and Ayala Corporation regarding the proposed merger of their education groups released on January 5, 2018.